I remember wandering the show floor at AWFS 2009 and seeing a booth featuring helical cutterheads for jointers and thickness planers and thinking “I need to get one of those for my tools!”. I also remember thinking about how amazing it would be if I had one with carbide cutters versus the usual high speed steel models I was familiar with. Over at Highland Woodworking their promoting the Steel City Planer with Carbide Cutters and it’s starting to pique my interests again. Anyone want to buy my old Rigid model? It works great, but after watching this review and reading the description, I want a new one. For more information on the Steel City Planer with Carbide Cutters CLICK HERE. 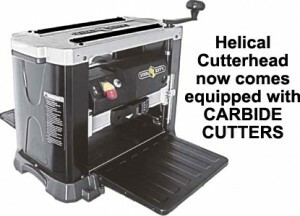 I have a steel city jointer with helical cutters if you want to check it out.